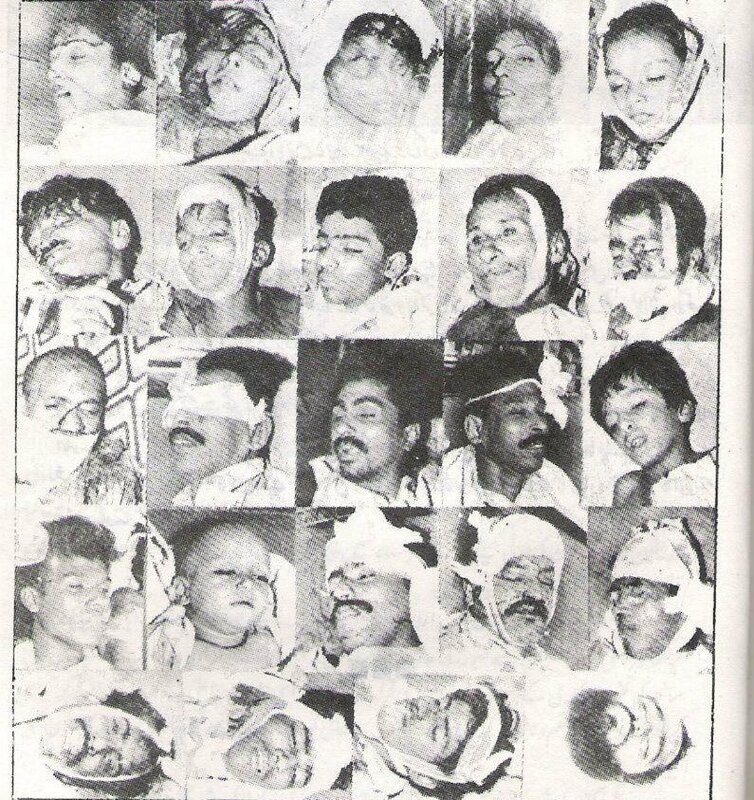 What happened from 19th of June 1992 in Urban Sindh, is black history. It is one of the most blackened chapters of the political history of Pakistan. 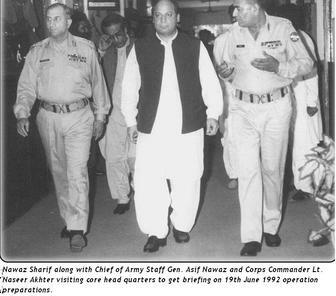 An operation was launched against MQM by the joint venture of the political as well as the military establishment ruling over the country at that time. 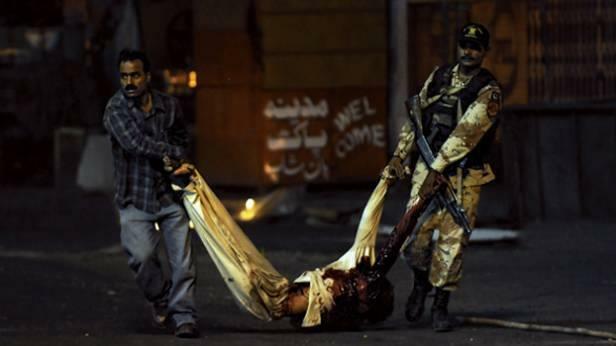 Karachi had been made a battlefield for the MQM workers. The Pakistani government launched Operation Clean-up (codenamed Operation Blue Fox) in 1992 and sent the military into Karachi to crack down on MQM. Planned by the FIA, Intelligence Bureau and launched under the directives of Prime Minister Nawaz Sharif in 1992, the program was more roughly pursued by upcoming Prime Minister Benazir Bhutto in 1993–94, as part of her internal policies. 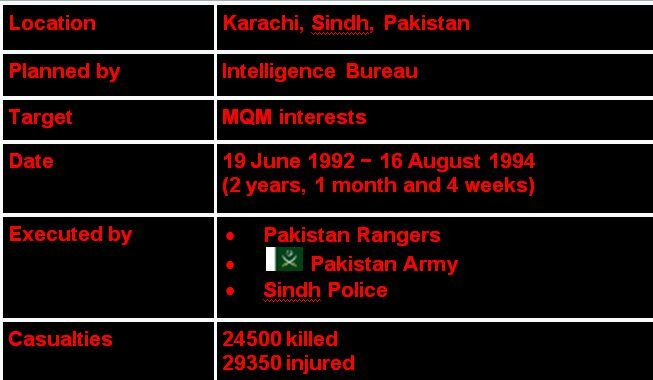 As per data in Wikipedia, there were approx 24500 fatal casualties and around 30000 Mohajirs were injured, however, it is said that there were more casualties which were not reported. 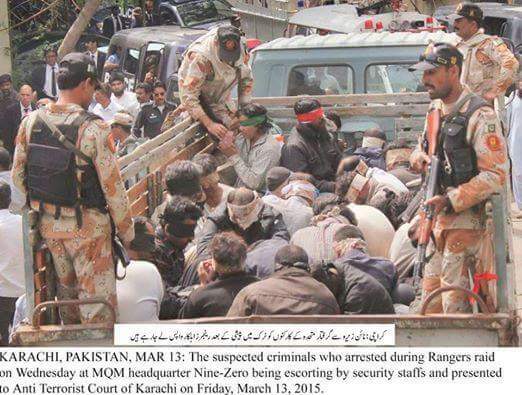 The operation’s objective was to “cleanse” Karachi city of “Mohajirs” who were tagged as “anti-national elements”. The program targeted the Muttahida Qaumi Movement. Among the reasons given for the launching of the Blue Fox were the Jinnahpur affair and the Major Kaleem Case in Karachi that occurred in 1993. The street fighting with the PPP continued in rural Karachi with the PPP’s controversial decision of forming of Malir District in 1994. 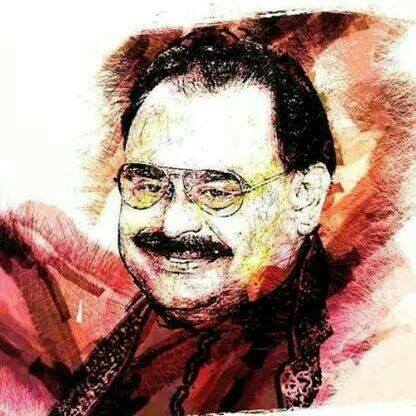 Altaf Hussain escaped Karachi one month before the operation began, following an attack on his life on 21 December 1991. Hussain fled to London and applied for political asylum. From 1993 to 1996, the port city of Karachi had become a political battleground between prime minister Benazir Bhutto’s Pakistan Peoples Party and the Mohajir Qaumi Movement. In the wake of the ensuing political unrest, the MQM had remained vocal about the arbitrary arrests and extrajudicial killings of its members. During Operation Clean-up, MQM was accused of being anti-Pakistan and of planning a separatist break-away state, Jinnahpur. However, later some senior army officers, Brigadier (R) Imtiaz and General (R) Naseer Akhtar, confessed that Jinnahpur was “nothing but a drama” against MQM for the military operation and there was no map of Jinnahpur. Asif Zardari who was then President of Pakistan is also said to have “said in court premises in Karachi that the Jinnahpur scandal was created to malign the MQM. Shunned by Bhutto’s disavowal, Altaf Hussain approached Nawaz Sharif, leader of the Islami Jamhoori Ittihad (IJI). The IJI was an opposition coalition eager to topple Bhutto’s government. As a result of their meeting, a formal agreement between the MQM and the IJI came to pass. However, when Sharif later came into power, he couldn’t honor those commitments either. Hussain became increasingly harsh and hostile in his opinions regarding the governing parties and would often accuse them of political hypocrisy. Seeing that striving for justice in a constitutional capacity was futile, ethnic militancy thrived. The gulf between Muhajirs and Sindhis widened leading to several cases of “ethnic cleansing” in Hyderabad. It was reported that the Karachi police and the paramilitary Rangers force had arrested Nasir Hussain and his son from the Federal B area in Karachi on 4 and 6 December 1995 respectively. In a statement issued on 7 December 1995, MQM blamed the government and the law enforcement agencies for the unlawful arrests of Nasir and Arif from their residence in Samanabad. On 9 December 1995, the badly mutilated corpses of both Nasir and Arif were found in an isolated area in Gadap Town in Karachi. Altaf Hussain revealed that while he was admitted in Abbasi Shaheed Hospital in 1988, Late Hameed Gul (ISI chief at the time) sent briefcase full of money through Brigadier(R) Imtiaz and tried to bribe him in joining Pakistan military establishment led IJI coalition which was against PPP but he rejected the offer. Later both Brig (R) Imtiaz and Hameed Gul also confirmed the statement. Does this kind of hatred not send a clear message that no one is ready to accept Mohajirs in Pakistan? Will such negativity against a minority ever result in ethnic harmony and unity that Pakistan badly needs to survive? Sad but true. Hope history does not repeat itself & the Kashmiri’s of AJK and POK have taken a note or two. Will a nation that questions the identity of its own people ever win the trust of others?